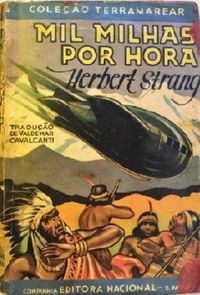 Mil Milhas por Hora – Herbert Strang – 1934 – tradução de Waldemar Cavalcanti: 'A Thousand Miles an Hour' (London: Oxford University Press / Humphrey Milford, 1924, 1928) [illus/Howard K Elcock: hb/D C Eyles] / A Thousand Miles per Hour by Herbert Strang in: "The Aerobus" collection, published by Humphrey Milford, Oxford, UK, 1937. 770 pages. 'TERRAMAREAR -- Os melhores livros para a Juventude. habitantes de outros planetas, piratas, navegantes, reis e bandidos. Rio de Janeiro, Domingo, 3 de maio de 1936. Página Dez -- Segunda Secção]. [About the Author]: Herbert Strang was the pseudonym used by 2 British authors, George Herbert Ely (1866–1958) and Charles James L'Estrange (1867–1947), to write adventure stories aimed primarily at young readers, especially boys. The pseudonym was also employed for several series of anthologies, works "edited by Herbert Strang" that included The Big Book of School Stories for Boys and The Oxford Annual for Scouts. There was in addition an anthology series for girls by "Mrs. Herbert Strang", who was also given as the author of some adventure books for girls, notably The Girl Crusoes: A Story of the South Seas. Their work showed a broad general debt to that of Jules Verne -- "Round the World in Seven Days" was one of their most popular books. Ely and L'Estrange have been classified as "popular writers of imperial fiction" and "successors of G. A. Henty". The books were very competently written, with a certain Edwardian dash (see Imperialism), and a fair amount of racist Cliché. [SFE: The Science Fiction Encyclopedia].